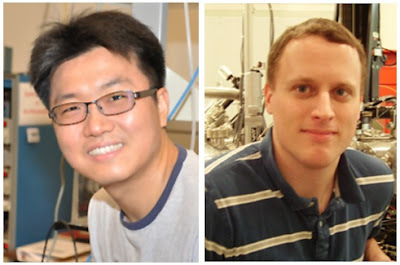 Suyong Jung (left) and Gregory Rutter (right), the leading authors of the Nature Physics paper describing quantum dot formation in graphene when placed on insulating substrates. Electronics researchers love graphene. A two-dimensional sheet of carbon one atom thick, graphene is like a superhighway for electrons, which rocket through the material 100 times faster than they normally do in silicon. But creating graphene-based devices with a full realization of this ultrafast electron transport will be challenging, say researchers at the National Institute of Standards and Technology (NIST), because new measurements show that placing graphene on a substrate, which is essential for graphene transistor operations, transforms its bustling speedway into hills and valleys that make it harder for electrons to get around. These hills and valleys can further localize the electrons into quantum dots when then graphene is exposed to an applied magnetic field, as reported in a new article in Nature Physics . According to NIST Fellow Joseph Stroscio, graphene’s ideal properties are only realized when graphene is isolated from the environment. “To get the most benefit from graphene, we have to understand fully how graphene’s properties change when put in real-world conditions, such as part of device where it is in contact with other kinds of materials like semiconductors and insulators,” Stroscio says. To see how graphene’s ideal properties are altered when placed on a substrate, NIST postdoctoral researcher Suyong Jung made a graphene device by exfoliating a single layer of graphene onto an insulating SiO2 substrate, using the so-called “scotch tape” method. The SiO2 substrate has a highly doped Si region on the back, which serves as a back gate conductor. When the bottom conductor is charged, an equal and opposite charge is induced in the graphene. This allows the researchers to study the electronic properties of graphene with different types of carriers, electrons versus holes, and with different densities by changing the potential on the back gate conductor. This extra experimental knob allowed the NIST researchers to develop a novel “gate-mapping” spectroscopy, when combined with scanning tunneling spectroscopy. The researchers used a home-built scanning tunneling microscope operating at 4 K to measure the electron density of states in the graphene as a function of applied magnetic field and carrier density. The researchers first identified the disorder potential hills and valleys in the graphene sheet due to the presence of the substrate by tracking the location of the so-called “Dirac point,” which is the energy location where the conduction and valence bands in graphene come to a point. At this point “ideal” graphene has no carriers, but when placed on a substrate graphene’s potential “hills” and “valleys” fill up with electrons and holes, which leads to puddles, like potholes filling up with water on a damaged highway. The electron and hole puddles reduce the mobility of electrons in graphene and even cause them to weakly localize in space. The effect of puddles, however, is more pronounced when electrons in graphene are exposed to high magnetic fields. In a magnetic field the electrons undergo cyclotron motion, where the carriers move in circular orbits. These orbits are not random, but take on only certain radii, which are quantized in terms of Landau levels, due to the laws of quantum mechanics. The electrons -- already made sluggish by the substrate interaction -- lack the energy to scale the mountains of resistance, and settle into isolated pockets of “quantum dots,” nanometer-scale regions that confine electrical charges in all directions. The NIST researchers were able to see the effects of the graphene quantum dots in their measurements in a number of ways. The electrons require a certain energy (charging energy) to tunnel into and out of the quantum dot, which gives rise to a pattern of Coulomb diamonds in the spectroscopic sample bias-gate voltage maps. A series of Coulomb diamonds indicate the sequential addition of single electrons to the graphene quantum dots. Interestingly, the diamonds occur in groups of four reflecting the four-fold degeneracies of electron and valley degrees of freedom in graphene. The spatial location of quantum dots was directly obtained by mapping the compressible (metallic) regions of the Landau levels at the Fermi-energy. Motivated by the current measurements, a somewhat unique application of graphene can be considered where information on insulating substrates can be obtained by first covering them with graphene, says NIST researcher Nikolai Zhitenev. Usually insulators cannot be studied at the atomic scale with the STM, since the closed loop servo requires a tunneling current to a conducting surface to maintain a constant tip-sample distance. On an insulator, no current is available. Placing the conducting graphene on an insulator lets researchers get close enough to these substrate materials to study their electrical properties, but not so close that the substrate and probe tip are damaged. S. Jung, G. Rutter, N. Klimov, D. Newell, I. Calizo, A. Hight-Walker, N. Zhitenev and J. Stroscio, "Evolution of microscopic localization in graphene in a magnetic field from scattering resonances to quantum dots", Nature Physics. Published online Jan. 9, 2010, DOI:10.1038/nphys1866. Abstract.